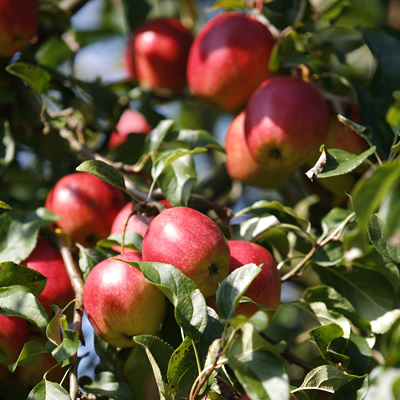 The fruit trees we offer are either dwarf or semi-dwarf. Grafting or bottom budding the root stock limits the size. Dwarf trees typically reach a height of 8-10 ft; whereas a semi-dwarf will grow up to 12-15 ft. Despite their size, dwarf trees have excellent fruit production. Bare root trees are potted immediately. If purchased within one month of potting, the tree can be taken out and stripped to the bare roots when planted. After a month the tree should be planted with the soil and root ball intact. Fruit trees should be planted in a sunny location. Sunlight equates to greater sugar production and faster ripening. Trees like good drainage. After digging the hole, fill with water and let it settle for 10-15 minutes. Standing water indicates you may have a drainage problem. You should consider building up the site or moving the tree to a better location. Whether planting bare root or with soil intact, the hole should be approximately twice the width of the root ball. Check that the bottom graft is kept above the soil level. Burying the graft can cause “suckers” to start growing from the root stock. Planting compost, like Gardner & Bloome should be added to the existing soil at a rate of 1.5 cubic foot per tree. This will insure optimum growing conditions and adequate nutrients for the new tree. It is not necessary to fertilize in early spring because the tree is not actively feeding. When the soil temperature reaches about 50 degrees, you can fertilize with a balanced organic fertilizer. We recommend organic fertilizers from Soil Science or Dr. Earth. A synthetic fertilizer, such as Lilley Miller All Purpose, is also a great option.